“The FENS-Kavli Network of Excellence has been running since 2014 thanks to the generous support of the Kavli Foundation and in collaboration with FENS. From its inception, two cohorts of exceptional junior and mid-career neuroscientists from across Europe have been joining efforts to shape the future of neuroscience. 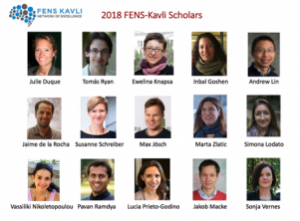 After a 4-year term, the first group of 2014 FENS Kavli Scholars will become alumni in September 2018. At the 20th FENS Forum in Berlin in July 2018, a new group of 15 remarkable Scholars were elected from a highly impressive pool of over 90 excellent candidates. I am convinced that this renewed group of Scholars will continue sharing their passion for science and thriving in the development of their multiple and creative actions on scientific, outreach and advocacy fronts”. Professor Carmen Sandi, President-Elect of FENS.